Footballers at a new club usually enjoy a little time to settle in but Dundee new boy Martin Woods admits he has to hit the ground running at Dens Park. 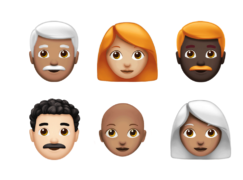 Apple has announced it will grant iOS users over 60 new emoji characters, including new hair colours, animals and smileys. Dundee United gaffer Ray McKinnon sprang a surprise in the Irn-Bru Cup on Tuesday when he used teenager Scott Allardice in central defence.